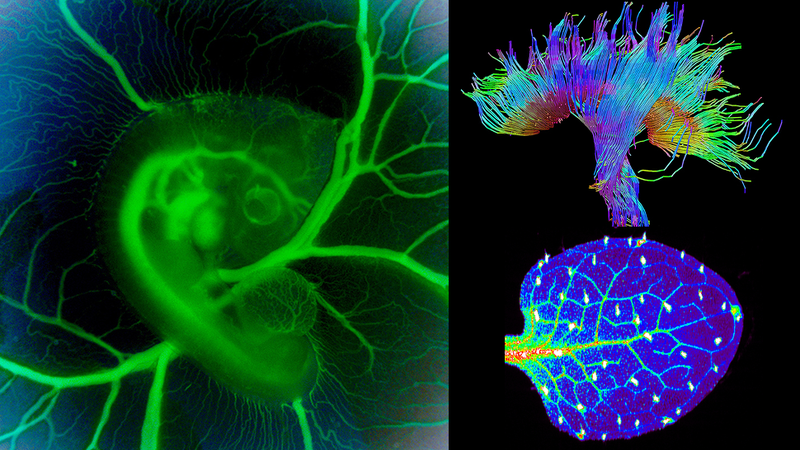 The winners of the 2015 FASEB BioArt Image and Video Competition have been announced, and they’re amazing. Chosen from a diverse cross-section of biology, they feature everything from the proteins that make up the Ebola virus through to roundworms feasting on bacteria. Here’s the best, most beautful science photos the year had to offer. [It] brings together spectacular examples of art created as part of biomedical research. Although the winning entries illustrate only a small segment of research being done across the country, they demonstrate how fascinating and beautiful biological science can be. The winning entries for 2015 include 11 images and two videos, all of which represent a particular branch of research in the biomedical and life sciences. All captions and images are courtesy of FASEB. Credit: Alice Dohnalkova, Environmental Molecular Sciences Laboratory, Pacific Northwest National Laboratory. Research Focus: Soil ecology and microbes. In this electron scanning microcopy image, an intricately structured soil bacterium (yellow) can be seen making its home on the root surface of an Arabidopsis plant (purple and blue). Much remains to be learned about the plant root zone (rhizosphere) and the microbes living within it. A research campaign is working to expand our understanding of the presence and distribution of carbon within the root zone and how it impacts the diversity and function of the microbes present. The ultimate goal is to develop predictive models to enhance the production of bioenergy crops and mitigate the negative impacts of climate change. Credit: Xiawei Ou, Arkansas Children’s Nutrition Center, Arkansas Children’s Hospital, and University of Arkansas for Medical Sciences, Little Rock, AR. Research Focus: Brain development and nutrition. Diffusion tensor imaging (DTI) permits researchers to non-invasively visualize in three dimensions nerve fibers connecting regions of the human brain. In this image, two important bundles of nerve fibers can be seen: the corticospinal tract, which transmits signals for movement from the brain to the spinal cord, and the corpus callosum, which connects the left and right sides of the brain. The colors indicate the spatial positions of the bundles as reconstructed by BrainVoyager software: left to right orientation (red), back to front orientation (green), and top to bottom orientation (blue). The USDA Agricultural Research Service supports Dr. Ou’s study on the effects of infant diet on brain development. Credit: Jenolyn F. Alexander, Veronika Kozlovskaya, Eugenia Kharlampieva and Biana Godin, Houston Methodist Research Institute, Houston, TX; University of Alabama at Birmingham, Birmingham, AL. Research Focus: Targeted drug delivery systems for cancer treatment. In recent years, much research has been conducted on nanoparticles and microcarriers as vehicles for targeted drug delivery. By increasing drug uptake by cancer cells but not healthy ones, this approach could increase the efficacy of treatments and reduce side effects. To optimize delivery, these NIH National Cancer Institute-supported investigators are exploring how the shape of a particle affects its transport through the body and uptake by targeted cells. This overlay image shows breast cancer cells (turquoise and purple) internalizing hollow, cubic microcarriers (gold, enlarged in the upper left hand corner). It was created using two types of imaging technologies—electron scanning microscopy and confocal fluorescence microscopy. Credit: Adam Brown and David Biron, University of Chicago, Chicago, IL. Research Focus: Behavioral neurobiology. Credit: Heinz Baumann, Sean T. Glenn, Mary Kay Ellsworth, and Kenneth W. Gross, Roswell Park Cancer Institute, Buffalo, NY. Research Focus: Pancreatic cancer. When multiple tumors or cancers have spread throughout the body, distinguishing which cell came from which tumor can be difficult. To overcome this challenge, this research team used “confetti” fluorescent labeling in their mouse model of pancreatic cancer. In this proof of concept image, adult mouse cells were induced to randomly make one of four different fluorescent molecules. The descendants of these cells continue to produce the same color as their parent cell. The NIH National Cancer Institute funds this research project, which seeks to identify genetic changes that contribute to pancreatic cancer. Credit: David S. Goodsell, Research Collaboratory for Structural Bioinformatics Protein Data Bank, Piscataway, NJ/La Jolla, CA. Research Focus: Structural biology. This illustration of the Ebola virus shows its seven structural proteins (various shades of blue, green, and magenta), RNA genome (yellow), and membrane (light purple). The small size of viral genomes greatly limits the number of proteins that can be encoded, so viral proteins often carry out multiple tasks. The Ebola matrix protein (light blue) is a notable example of this phenomenon: it changes shape for each of its different jobs. Through the Protein Data Bank, the three-dimensional structures of Ebola virus proteins are made freely available to investigators around the world to promote research on how to fight this deadly virus. Credit: Nathanaёl Prunet, Elliot Meyerowitz, and Thomas Jack, California Institute of Technology, Pasadena, CA, Dartmouth College, Hanover, NH, Howard Hughes Medical Institute. Research Focus: Stem cells and flower development. Credit: Suzana Car, Maria Hindt, Tracy Punshon, and Mary Lou Guerinot, Dartmouth College, Hanover, NH. Research Focus: Plant biology and nutrition. Credit: Shachi Bhatt and Paul Trainor, Stowers Institute for Medical Research, Kansas City, MO. Research Focus: Developmental biology. Credit: Jessica Ryvlin, Stephanie Lindsey, and Jonathan Butcher, Cornell University, Ithaca, NY. Research Focus: Heart development. During the embryo development, the formation of congenital heart defects alters blood flow patterns. In this NIH National Heart, Lung, and Blood Institute and National Science Foundation research project, investigators are studying how these patterns change and developing measurement tools with the aim of improving diagnosis of heart defects in human embryos. To observe normal and abnormal heart development in real time, the researchers delicately transfer live chicken embryos from an egg shell to an artificial container. Microsurgical manipulations are used to induce heart defects to model blood flow pattern changes. Images, like this one, are created without any dyes and are instead enhanced using photo manipulation software. The modified images allow researchers to better visualize the developing heart (to the left of the eye) and the network of blood vessels from the heart and throughout the chick embryo. Credit: Olivier Duverger and Maria I. Morasso, National Institute of Arthritis and Musculoskeletal and Skin Diseases, National Institutes of Health, Bethesda, MD. Research Focus: Tooth enamel development and structure. Enamel is the hardest substance in the body. It protects the surface of the tooth. This scanning electron microscopy image shows the lattice pattern formed by enamel rods, an arrangement that confers strength and flexibility. Genetic mutations affecting enamel formation can result in defects in the thickness, mineralization, and/or lattice pattern of the enamel. This can produce weak teeth prone to decay, which in turn can increase other health risks such as systemic infections and heart disease. These NIH investigators from the Intramural Research Program of the National Institute of Arthritis and Musculoskeletal and Skin Diseases are using mouse models to study how genetic variation affects enamel development and health. Credit: Mehmet Berkmen and Maria Penil, New England BioLabs, Ipswich, MA. Research Focus: Interactions between bacterial colonies. Dr. Mehmet Berkmen’s laboratory built a unique chamber that allows scientists in the lab to photograph bacteria colonies grown on agar plates for several weeks. Because agar rapidly dehydrates, such long-term growth would not be possible outside the specialized time-lapse photography chamber. The researchers use this method to study long-term interactions between colonies of bacteria. In this video, bacteria painted onto an agar plate grow into an image of a flowering plant. Several different types of bacteria can be seen, including Serratia (red), Bacillus (white), and Nesterenkonia (yellow). Credit: Kimberly Leiken and Elana Harris, Cincinnati Children’s Hospital Medical Center, Cincinnati, OH. Research Focus: Obsessive Compulsive Disorder. This video shows brain activity in an individual with Obsessive Compulsive Disorder who is lying still. Each cube represents brain activity recorded by a sensor in a magnetoencephalography (MEG) helmet, and the different colors indicate activity level (red highest, blue lowest). The researchers used MEG and other neuroimaging technologies to assess treatment responses in individuals with Obsessive Compulsive Disorder. This NIH National Institute of Mental Health-supported study also explores whether there is a relationship between symptom severity and aberrant MEG measurements.